Any way to add more than one wallpaper at a time? 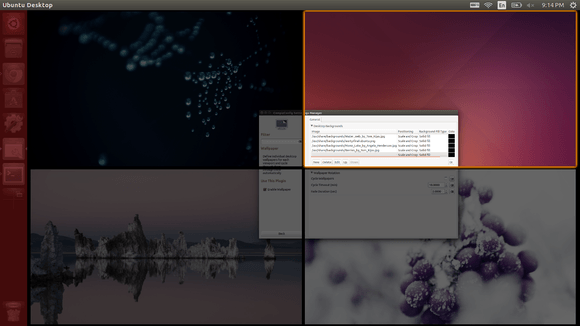 adding this feature in ubuntu 12.04 makes the icons on the desktop dissapear, is this still the case in ubuntu 14.04? yes, just don’t enable this feature if you use desktop shortcuts. When I use the wall papers plugin I can get different wallpapers on each workspace but I can only get solid colours or gradients not images how can I fix this? This worked for me in Zorin OS 9 “Trusty” which is ubuntu based.